It appeared at first that the vote would be 4-1. 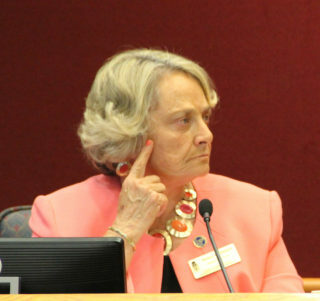 However, after hearing more details regarding the annual debt service — not to mention the related cost savings — Sarasota County Commissioner Nancy Detert joined her four colleagues on the board in approving the county’s payment of $15,765,280 for a 71,592-square-foot office building on Cattleridge Boulevard in Sarasota for Sheriff Tom Knight’s administrative staff, evidence storage and consolidation of his department’s scientific divisions, including Forensics and the Drug Lab. With closing costs and improvements to the structure, a staff memo says, the total the county is expected to invest in the project is $16,255,083. The 4.25-acre site is located 1.5 miles from the county’s Emergency Operations Center on Cattlemen Road and has “immediate potential access to [Interstate] 75, [if necessary,] “during a catastrophic weather event,” Jeff Lowdermilk, director of the county’s General Services Department, told the board during its regular meeting on Feb. 7. Additionally, the structure — which was built in 2004, he said — can withstand 130-mph winds. Knight will be able to relocate staff from two county-owned facilities and two leased buildings, Lowdermilk noted. If the commission approved the purchase that day, he added, staff anticipated the completion of renovations in late summer. The other three are the new Sheriff’s Fleet Maintenance Facility on Laurel Road near Venice; a new single-story courthouse structure on the campus of the county’s R.L. 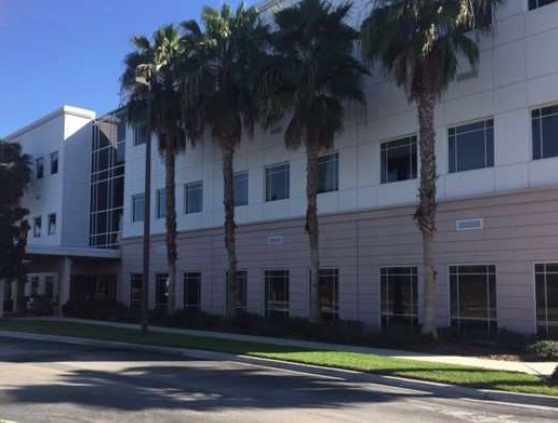 Anderson Administration Center in Venice, plus renovations to other parts of the Anderson Center; and a new Central Energy Plant to replace the structure in downtown Sarasota that provides cooling for a number of county buildings. 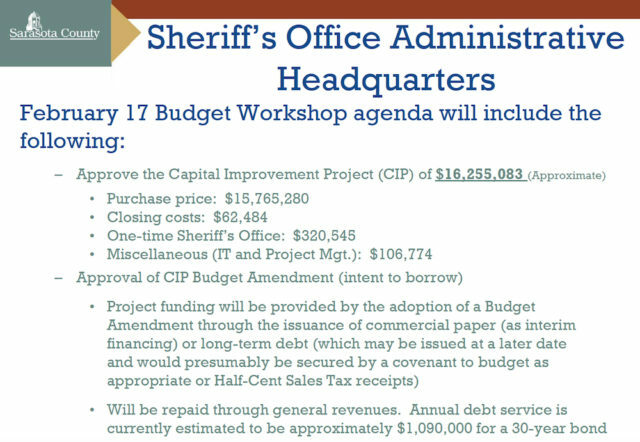 During his Feb. 7 presentation, Lowdermilk explained that after the County Commission in May 2016 abandoned the idea of a Public Safety Referendum on the November 2016 Presidential Election ballot, staff was asked to find a more affordable means of meeting the Sheriff’s Office’s needs. 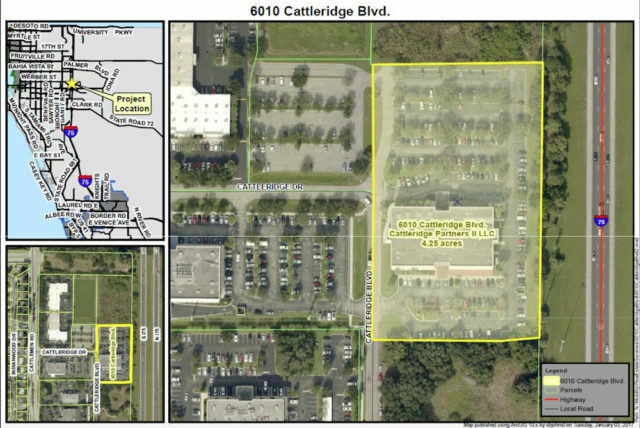 Knight’s proposed facilities on county-owned land next to the Emergency Operations Center had been estimated at $107.8 million out of referendum funds, Lowdermilk said. They would have included not only a new administrative headquarters but also training and parking facilities. Purchasing the building at 6010 Cattleridge Blvd. will enable the sheriff to consolidate about 190 of his employees in one location, Lowdermilk pointed out. 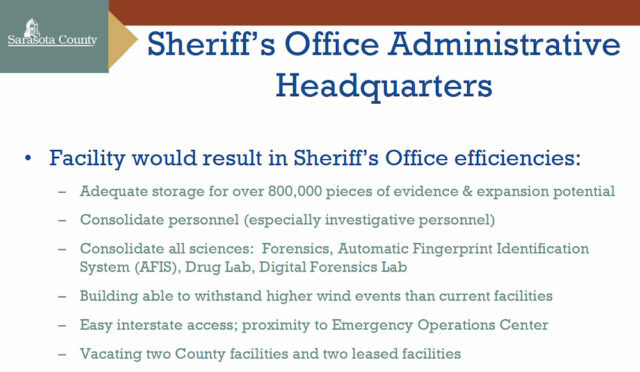 And while staff had considered the option of leasing the structure, Lowdermilk continued, a more in-depth review of the Sheriff’s Office’s needs indicated that — because of space customization requirements — it would be more cost-effective for the county to proceed with the purchase. The annual debt service on a bond to cover the price would be $1,090,000, if a 30-year amortization period were secured, as staff expected. “I’ve toured this building,” Commissioner Maio said. “I think it’s perfect for our needs,” he added, and it is substantially lower in cost than the Sheriff’s Office portion of the referendum would have been. Detert then raised her concerns about the county’s borrowing money for the project. Perhaps Knight would be willing to make a one-time, $1 million concession in his budget to cover maintenance expenses, for example, to help the County Commission with the expense, she added. 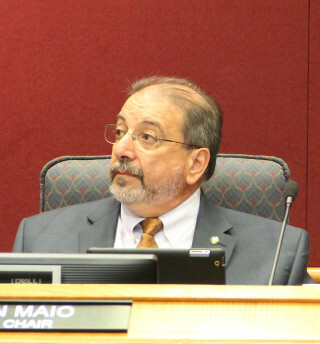 Maio responded with the details about the previously proposed referendum. Altogether, he continued, the estimates staff had provided the board put the referendum at $230 million to $240 million. Knight ultimately asked the board to remove his projects from the proposal. He cited a number of factors, not least of which was his concern that the already contentious Presidential campaign would make voters less inclined to view the referendum favorably. After Knight made his request in May 2016, the commission scrapped the idea for the referendum and asked staff to examine the projects separately, to determine whether the county could pay for them by borrowing up to $22.6 million for each, as allowed by the County Charter without voter approval. Following that direction, Maio continued, staff managed to whittle down the total cost of the four projects to about $70 million. Immediately after Maio completed his remarks, Commissioner Mike Moran made a motion to approve a resolution for the execution of a contract for the purchase of the structure from Cattleridge Partners II. Then County Administrator Tom Harmer explained that if the staff and board could not identify sufficient funding to cover the expense, the commission could terminate the contract negotiations. However, in response to a question from Chair Paul Caragiulo, Harmer said the county would incur a penalty up to $75,000 if it had to back away from the purchase. “Ironically,” Moran told his colleagues, “I was a tenant in this building for an extended period of time. … This is a quality asset,” with long-term value to the county’s taxpayers.